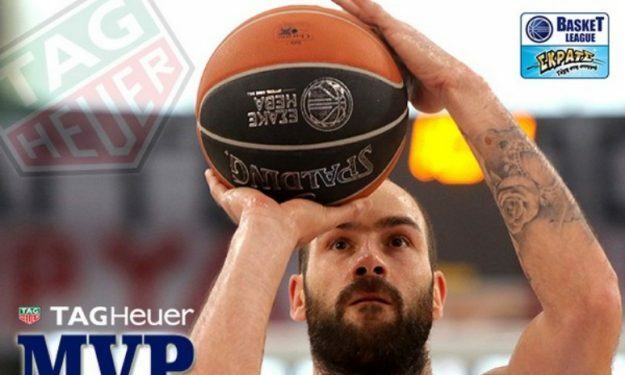 As the Greek Basket League announced, Vassilis Spanoulis of Olympiacos was named MVP of the 2015/2016 season. As the Greek Basket League announced, Vassilis Spanoulis of Olympiacos was named MVP of the 2015/2016 season. He was almost unanimously voted as such by the coaches and the captains of the 14 Greek League teams, gathering 20 votes against 3 that went to his teammate in Olympiacos Giorgos Printezis. In the media voting he was picked as MVP 18 times, with Okaro White, of Aris and Printezis receiving one vote each. Spanoulis was the man of the hour in the Finals against Panathinaikos hitting two spectacular last seconds game winning three-point shots (one of them a buzzer beater) and putting his signature in Game 3, where he scored 11 points in the last three minutes of the match to give his team a decisive victory for the 2-1 in the series. He was the top scorer and passer of Olympiacos during the season, averaging 13.1 points and 5.4 assists per game.